The American Society of Human Genetics has named Leonid Kruglyak the 2015 recipient of the Curt Stern Award. 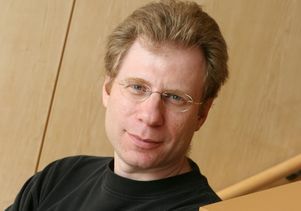 Kruglyak is a professor of human genetics and biological chemistry at the David Geffen School of Medicine at UCLA, a Howard Hughes Medical Institute investigator and a founding member of the UCLA Computational Biosciences Institute. Named for the late pioneering geneticist Curt Stern, the award recognizes outstanding scientific achievements in human genetics in the past decade that occur early in a researcher’s career. Kruglyak will be honored Oct. 9 during the society’s 65th annual meeting in Baltimore. Kruglyak devoted his early career to understanding how a person’s genes interact with each other and the environment to influence his or her traits, such as appearance, behavior and susceptibility to various diseases. As a postdoctoral researcher in the mid-1990s, he developed algorithms for a computer program called GENEHUNTER. The program enabled scientists to perform complicated calculations for genetic linkage on personal computers and quickly became a standard tool for mapping complex disease genes. Over the next decade, he published key papers predicting the number of genetic markers required for genome-wide association studies in humans and pioneered the field of genetics of global gene expression (now known as eQTL analysis). More recently, Kruglyak’s laboratory has used genomic technology to establish the yeast species Saccharomyces cerevisiae and the roundworm Caenorhabditis elegans as models for studying complex genetic variations. A member of the society since 1999 and a fellow of the American Association for the Advancement of Science since 2007, Kruglyak has earned many awards, including the James S. McDonnell Centennial Fellowship in Human Genetics and the Burroughs Wellcome Fund Innovation Award in Functional Genomics. In 2007, ISI Thomson Scientific named Kruglyak a highly cited researcher in molecular biology and genetics; his work has been cited more than 40,000 times by scientific literature.